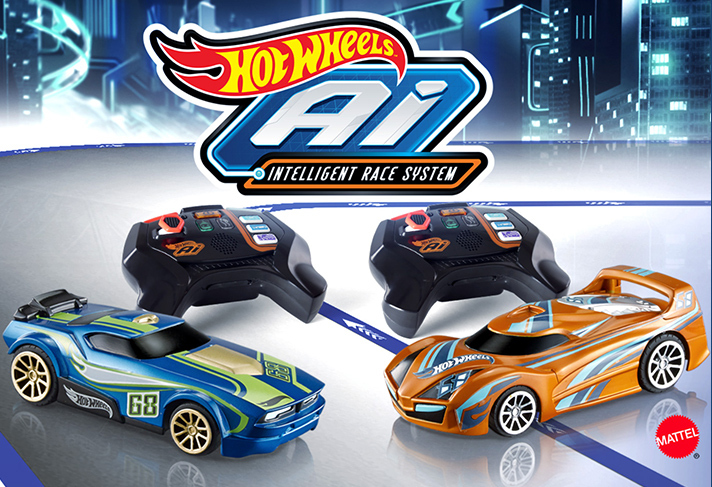 Mattel’s Hot Wheels Ai Intelligent Race System is the next generation of immersive track racing that uses Hot Wheels Smart Cars and a customizable Hot Wheels Smart Track. Launched over two years ago, the smart racing system is ahead of its time and an affordable way to experience the awesomeness of artificial intelligence on a race track. What is the Hot Wheels® A.i. Intelligent Race System? If you like remote-controlled cars and think they can be smarter, then you’re going to love the Hot Wheels® A.i. Intelligent Race System. Developed by the most trusted name in scale-sized cars for the young at heart, the new racing system is infused with artificial intelligence capabilities built into the car and track pieces. Essentially, it’s a smart racing kit that comes with two Smart Car units, two wireless controllers and 20 pieces of a Smart Track that can be configured in more than 40 different ways. The tracks are made of vinyl-coated paper mats that use a tab and slot system to join to each other. How Is Hot Wheels A.i. Better Than Traditional Toy Race Cars on a Track? Hot Wheels has leveraged the power of artificial intelligence to give its racing system a serious upgrade. The cars are capable of scanning the track 200 times a second, and the AI component helps you keep your car on the track. It comes with three different racing modes and three gameplay modes for different skill levels. The cars are capable of 180 mph scale speed, and the controllers deliver voice and sound effects to enhance the racing experience. The Smart Cars that come with the kit are FAST FISH and SPIN KING, known for their speed and agility, and famous drifting moves on the latter. The controllers are LED backlit, and come with an Auto-Drive Mode that enables hands-free operation. One of the more fun components is the ability to lay virtual hazards for your racing rival. But be careful because they’ve got them, too. The hazards are automatically reloaded when you take your car through the pit lane using the RC Assist mode. Virtual Hazards include oil spills, tire blow-outs and more. Race against a friend or even against an AI self-driving car in Championship Mode. You can set the skill level to Beginner, Advanced or Expert. What are the Three Modes in Hot Wheels A.i.? Championship Mode is the full racing deal. Either race with the AI driving the other car, or pit yourself against a human rival controlling the other Smart Car. Practice Mode lets you hone your skills on the track and gain experience before pitting your driving skills against a human racer. It also lets you time your laps so you can keep improving. Freeplay Mode lets you go off-track like a normal remote-control car. If you get bored of going round and round, just drive it off the track and take it for a spin wherever you like. Where Can I Buy Hot Wheels A.i.? At well under $100, the Hot Wheels Ai Starter Set Street Racing Edition is not as expensive as you might think. You’ll also find some pre-owned pieces when you go to that Amazon page. Just click the image above to head over. You can also get it from traditional retailers like Walmart, Best Buy and Kohl’s.